One of the biggest challenges in the weeks I’ve been working at Border Collie Rescue has been learning to let go. The first dog I've ever trained at the rescue was recently adopted. This is my sweet little Shank.Yeah we had a good laugh for a while since they gave the dog named Shank to the Hispanic girl. He was the dog I trained agility and obedience to. He was able to make me love another breed of dog besides German Shepherds. He was my baby who enjoyed a good bath and belly rub. Two summers ago he was adopted by a couple, but before I came back he was returned to us. It seemed like he didn't get along with the wife and developed jealousy aggression since he connected more with the husband. I was very disappointed with myself for not catching this quirk of his, but I continued training him and CJ for some time. Then a miracle happened! Another couple came by to view some of the dogs and they were both very funny. 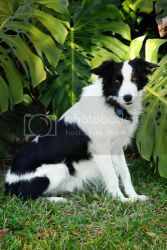 One of the women had an elderly female border collie who matched her owner, short and broad. The other woman was tall and skinny. When we brought Shank out it seemed like a match made in heaven. The other dog loved him and the tall lady was very impressed with the tricks I taught him. When I looked at them all together I hoped they would choose him because the dogs definitely matched their owners. They left to think about whether or not they wanted to adopt and I just prayed and hoped that Shank finally found his new home. I was gone for a day training a service dog on campus and when I came back Shank was gone. It seems that they picked him up the next day and brought him home. I was sad that I couldn't say goodbye to the big goof, but I was happy that he found his a family. I went through my usual routine of sadness. But then I got over it, looked on the bright side of things and ran around with glee. This was one of the challenges I faced, the other was less of a crying-palooza and more of a heart attack waiting to happen. So I let out a group of three dogs; Talan, Summer and Boonie. They are a great and chill group who don’t appear to give me trouble Summer and Boonie are new, but they are sweet and I let my guard down. So I’m sitting in the living room eating my turkey and cheese sandwich with an awesome side of apple juice when suddenly I hear a bang on the door. I almost drop my lunch at the sudden noise. Everything goes silent and then all hell breaks loose. The door bursts open, my sandwich is on the floor, I'm screaming my head off running away to find a weapon, and the parrot is screeching. When I finally turn around I find myself facing a huge fluffy border collie. She pants and wags her tail with pride at finally being able to get inside the house. I’m shocked and baffled to how she managed to get in and noticed that her border collie intelligence managed to find a hole into the small porch of the house. I also noticed she ate my sandwich. I learned the hard way that I need to lock the front door or dear old Summer will find a way inside. Remembering every dogs quirk has taken me sometime, but I think I have them down packed. For now. My next challenge involves the service dog I’m training. Kurt is an angel and loves people. No I mean loves people, if there was a person across the street that would offer to pet his belly with traffic separating them. That dog is like the honey badger! He doesn’t care, his tush would get ran over and he won’t mind as long as you pet him. Now you see what I have to tweak. He is a velcro-dog, he will never leave your side and is stuck there. Kurt loves people and people love him. His nickname to some is No-Ears due to the fact that his ears are never perked up when he is around people, they are always down in contentment. I don’t care what people tell me, but that dog is no dog. He is a full blown ham sandwich and he loves it. For now these are some of my challenges that I face at the rescue and I;m expecting more in the future. Have fun this summer guys! I’ll keep you all posted for week 3 soon!